1. SHARP blades - The blades are made from HIGH QUALITY FOOD GRADE stainless steel and are ultra sharp, so you will use them with minimal effort. 2. Mutifunctional - using these scissors for cutting vegetable, meat, poultry, opening bottle caps, cracking nuts, cutting hard plastic products, opening boxes and packages, removing herbs leaves. 3. Comfortable - Soft TPR handle inner rings providing the best comfortable feel and ensures non-slippery. 4. 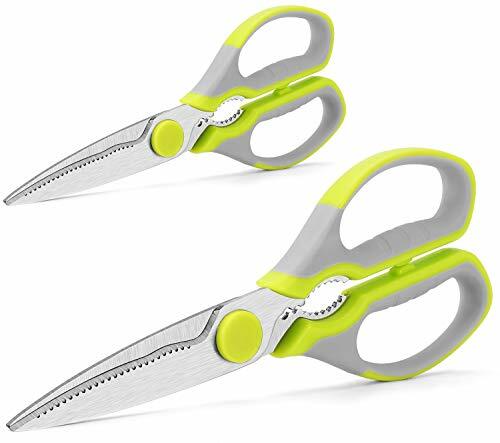 Perfect gift item for family and friends: These scissors are perfect for kitchen uses, and great for household or gardening uses. 5. Dishwasher safe, but hand wash recommended. THIS SET INCLUDES TWO PAIRS OF MULTI-FUNCTIONAL SCISSORS: ONE SCISSORS FOR KITCHEN USE, ANOTHER ONE FOR HOUSEHOLD AND GARDENING USE.